J.W. 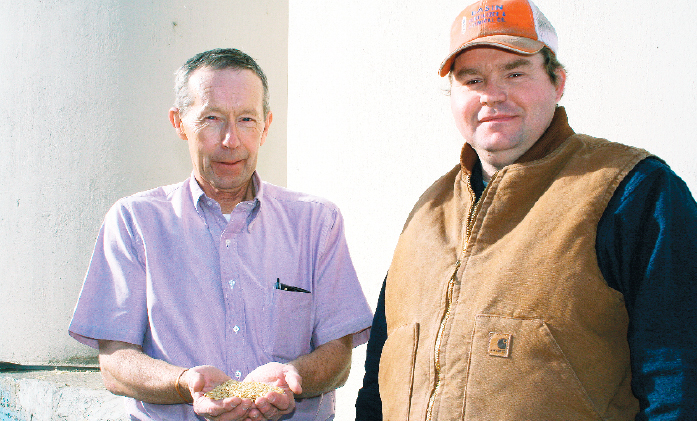 Cope, left, a grain merchant for Winema Elevators in the Klamath Basin, and Tony Alexander, manager of Stronghold Elevator in Tulelake, report that there was strong interest in growing wheat this year in Northern California. Ideal growing conditions in California’s northern intermountain region this year resulted in a bountiful harvest of high quality wheat. Wheat growers in California's northern intermountain region enjoyed bountiful harvests this year as a result of exceptional growing weather and an ample water supply. "It was the best grain-growing weather we could have imagined. When the grain was in its active growth state, we had only a few days over 90 degrees, and we were hardly over 95 degrees," Etna farmer Brandon Fawaz said. Grain really shuts down its growth when temperatures rise above 90 degrees, especially 95 degrees, Fawaz said: "High temperatures will really set it back, and we never had those temperatures this year." The intermountain regions have a limited growing season. In Scott Valley, for example, there is an average of only 140 frost-free days each year, said Jim Morris of Bryan-Morris Ranch in Etna. The restricted growing season also limits planting choices for farmers, Morris said. "In the past it's been forages and cereal grains, and now a lot more cereal grains," he said. Steve Orloff, University of California Cooperative Extension farm advisor, said growers in the intermountain areas typically raise more hay, with grain being a rotational crop. One reason is that frequently raising grain turns out to be a losing proposition for growers, Orloff said. "It's just kind of a necessary evil. They just break even and want to get into alfalfa again," he said. This year, however, the increased grain prices resulted in additional interest in growing hard red spring wheat. "We've got more grain growing this year than we traditionally do," Orloff said. J.W. Cope, a merchant for Winema Elevators in the Klamath Basin, another intermountain region, said he's seen an increase in wheat acreage and in grain production overall in his area, too. Whether this increased acreage continues in subsequent years will depend in part on grain prices and an adequate water supply, Cope said. In his region, the acreage is determined by the water availability, and this year growers had adequate water to justify full planting, he added. The Klamath Basin had a high yield and good-quality crop, too, Cope said. "Some people got the best yields they've ever seen," he said, adding the higher yields and quality were due to the cool summer and lack of severe frost in September. With the price of grain so high, Morris and other growers in his area are harvesting grain for grain, he said. "That's a change for our area. It hasn't been that way," Morris said. "A lot of people are growing dual- purpose grains or awnless grains, which means they can harvest grain for grain or cut it for hay depending on the best market. That wasn't the way the world worked in the past, but it is today. Stuff moves really quickly." Morris has seen firsthand how quickly the market can turn, recalling how he had great difficulty selling his hay in 2009. Currently, Morris is growing a high protein hard red spring wheat and that market is very strong. "We can do it here, and we can get the protein where it needs to be. So until that market turns around, I think that's where we are for a little while," he said. Fawaz said he has found raising grain for grain was much more feasible for him than grain hay, for several reasons. First, grain can be shipped out of the field, so it doesn't have to be stored, and growers are paid right away, Fawaz said. "Most farmers in this area are always tight on their hay storage space," Fawaz said, so putting 10 to 20 percent of their ground into grain production frees up 10 to 20 percent of their hay storage. Another advantage with raising grain for grain is it can be inexpensively insured against frost, hail or fire damage, Fawaz said. The cost of harvesting grain for grain is much less versus grain hay, Fawaz said. 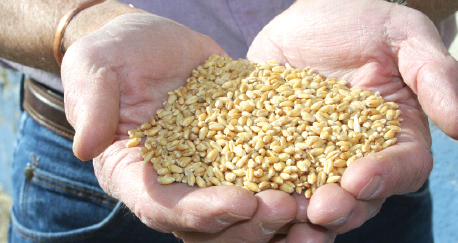 "I do custom harvesting and charge anywhere from $40 to $45 an acre to custom harvest grain. And typically we run two and a quarter to three tons of grain per acre, and that's a fixed price of $40," he said. With grain hay, there is usually double the amount of hay compared to grain, five to six tons per acre, Fawaz said. He estimates on six-tons-to-the-acre grain hay, harvest costs would be about $180 an acre to custom harvest. Fawaz said he feels grain is far more forgiving in terms of weather. "When the grain's ready to harvest, if a thunderstorm comes, you get a little rainshower, we'll let it dry out, and then we'll go back to harvesting," he said, adding that isn't the case with grain hay. Fawaz sees two advantages to planting grain hay. The first is for fall planting of alfalfa. Fall alfalfa has to be planted by Aug. 25, and getting grain harvested by then, and getting all the field work done and ready to plant by Aug. 25, is difficult, he said. "It can be done, but it's tight," Fawaz said. "The other slight advantage to grain hay, and I think this argument is easy to get around, is if you had a customer that bought all his hay exclusively from you and he always needed a little bit of grain hay, you wouldn't be able to supply it to him." Fawaz added that it wouldn't be a problem to find grain hay for him from another grower. More grain was planted in his region this year than in any other year, Fawaz said, and that's a factor of higher grain prices. "It's more profitable to make the grain," he said, adding if grain prices decline, and the hay market remains constant, growers will go back to making grain hay. The savvy grower will look at how best to maximize profits, and right now, raising grain for grain makes the most sense, Fawaz said.